Traveling abroad and paying for everything has gotten a lot easier over the past 10 years. I’ve never had the pleasure of using a travelers check but I hear they were quite the adventure. Nowadays though, when I travel abroad I take two debit cards, two credit cards and a couple hundred dollars in cash. There are a lot of things to worry about when you’re traveling but how to spend your money shouldn’t be one of them. I’ve traveled to over 20 countries on 3 different continents and found that the best way to access my money is through ATM’s and credit cards. ATM’s are ubiquitous in almost all countries and you will often receive the best exchange rate going this route. And although ATM’s are convenient, I prefer using a credit card for large purchases like train tickets or expensive meals and souvenirs. Every bank and every country is different but using this standard approach should save you some money and remove a lot of the hassle. I haven’t been to Europe in a few years but I’ve heard that some vendors only accept ‘chip’ credit cards. Most American credit cards don’t have this chip so you may want to inquire with your bank about getting one. Personally, I’ll take my chances with my regular cards because I always have my ATM cards as back-ups. When I travelled all over Eastern and Western Europe in 2007-2008, my ATM card and credit cards worked just fine. On my most recent trip abroad(to Japan), I was able to use my ATM card without ever getting charged a fee. It seems like in non-US countries it’s customary for the ATM owner not to charge you a fee(but your bank might). I’m planning a trip to Turkey and the UAE and I’m curious to see what type of cards work best there. I know that you can actually pay for certain things in USD in Turkey so cash might come in handy there. But the UAE is probably a different story since it is a much more modernized city. I would expect my credit cards to be accepted more frequently there than somewhere like Turkey. Calling your bank ahead of time to let them know you’ll be traveling doesn’t always work. Instead, carry your bank’s international phone number if problems arise abroad. Sign up with a bank like Ally or ING that doesn’t charge any ATM fees(I sincerely hope none of my readers are still paying ATM fees!). Don’t worry about finding ATM’s. They are everywhere! 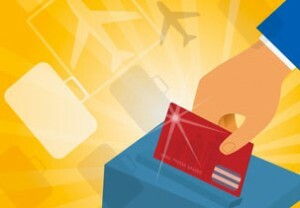 Credit cards provide the most safety when you’re traveling abroad since you’re never liable for unauthorized purchases. It’s a lot more difficult to challenge an ATM transaction. Visa is king, Mastercard is a close second and AMEX is last when it comes to who will accept what card. Don’t use your credit card to withdraw cash from an ATM. Bring a back-up card of different branding(i.e. Visa and Mastercard). Instead of worrying about keeping your card in plain sight at all times, just stop by an internet cafe every few days and check your transactions. You’ll never be held responsible for unauthorized activity, whether you’re in the US or a foreign country. Readers, how do you pay for things abroad? I’ve never encountered a merchant that wouldn’t take my card because it didn’t have a chip or a PIN, have you? I found that some automated transit ticket purchasing machines would only take chip cards or cash. Only the machines in the main stations had tellers next to them, so you simply couldn’t buy a ticket if you didn’t have a chip card (or cash)! I actually opened a Charles Schwab checking account recently because they have no international (or domestic) ATM fees! I haven’t had a need to use it yet, but I’m sure it’ll work great. Taking debit cards from different banks/credit unions is nice too because different ones have different exchange rates. Or then you have a higher maximum daily withdrawal 😉 I try to just use credit cards while in Europe though because no one there gives receipts for cash transactions and that makes stuff hard to track. Is Turkey for a honeymoon?! Oh really? I’ve never heard that before but I haven’t been to Western Europe in a few years(is that where you were?). When I was in Japan a year and a half ago, all the machines took my cards and I used mainly credit cards to pay for everything. Having no ATM fees is so nice, I only take out what I need that way, usually only $20 or $40. This was Western Europe, yeah. Haha, yeah I’m pretty sure planning a wedding will be my least favorite thing in the world. Great post. This is something I’ve had to think about a bit as I’m going to Thailand soon. I’m thinking I’ll just take out some cash but mainly use my mastercard. I’ve used it when travelling in the U.S. and haven’t ever been charged a fee but I think I better check that’s still the case in a more foreign country than the States. Nice, I absolutely loved Thailand, it was a ton of fun! I don’t remember many places taking credit card, but my ATM cards worked well there. My friend brought travelers checks and he ended up borrowing money from me the whole time. Just grab a couple no fee ATM cards and you’ll be set. Great tip about the chip credit card, I have the opposite problem in Guatemala when my chip card doesn’t approve payments when they slide it. My bank would block my card if I don’t call them to say in which country I’ll be before traveling. It wasn’t fun trying to withdraw money at the airport with a blocked card. I heard good things about charles schwab too, and would look for a 0 fee on withdrawal card if possible, some charge an insane amount! Haha oh that’s funny, I never thought about it that way. I feel like whether you call ahead of time or not, the banks always end up screwing it up somehow. That’s why I bring cash and just call them when I’m over there if my cards don’t work. Yes, a lot of european countries use chip and pin. A lot of gas stations in europe use chip and pin only. None of the US does. Up until recently, I carried my amex prepaid (good for ATM and a credit), paypal master card debit, chase sapphire preferred visa, ink bold mastercard. The prepaid’s have gone by the wayside for the moment, but the sapphire preferred and ink bold are still golden, with my normal bank’s debit card for the atm. hopefully you’re going to turkey and UAE in style! I was working in Canada and some other people from another company brought their discover cards. Didn’t work too well. Amex is pretty universally accepted, except for at ATM’s. I had a hard time in Hong Kong Last month, but everywhere else I could find an ATM that took Amex (cambodia, thai, korea). Not all prepaids work overseas. But the “vanilla” amex prepaid does (no forex). And I don’t mind paying fees on some cards. I may try to trade in my Sapphire PRef for a mastercard version and swap my ink bold to a plus (with sign on bonus, of course), but I will pay the fees if I need to. I’m having a hard time burning through my UR points :). Just booked a trip to bali in F, asiana F suites and Cathay F on return. No too shabby for $165 return for 2 people. Haha oh I feel so bad for you 🙂 I have a lot of domestic points to use up this year, should be fun. Good post. It’s been a few years since we’ve been to Europe and really did not run into any problems. We had multiple credit cards and used the multiple network tip for our debit cards. We’ve been to the Caribbean more recently and did the same thing. I think all totaled we got charged maybe $5 in fees over the entirety of our trips. I’ve only traveled abroad once and it was on a cruise a few years ago. I didn’t even think about fees or whether or not my card would be accepted. Luckily for me I didn’t have any issues but if we’re to travel overseas again then I’m definitely going to have to do a bit of research before-hand. Yea I’m waiting for a good sign-up bonus on a Capital One no annual fee card since they don’t have any international fees. All of my cards with no international fees will start charging me an annual fee soon, so it’ll be time to ditch them! I’ve always used my Visa when abroad and I’ve never had any issues, but it’s been a while since I’ve been in Europe. Does the chip cards offer anything special to merit exclusive use? I think the chip cards come with a PIN so that increases the safety of the card. They’re a lot less likely to be cloned or stolen in that manner. And with everything going wireless, I think the chip makes more sense since you don’t have to swipe anything.